If you want to learn about the hottest programming languages today, don't miss this list from IEEE Spectrum. This respected organization, which has 400,000 members and is considered the world's largest association of technology professionals, enlisted the services of Nick Diakopoulos, a well-known computational journalist and assistant professor at the University of Maryland, to compile the language rankings. Diakopoulos proceeded by weighing and combining 12 metrics from 10 sources, including IEEE Xplore, Google and GitHub. The result is a compilation of languages that cover big data analytics, graphics, system administration, network programming and virtually every other tech-supported function. The February issue of the DACS Journal of Software Technology focuses on Software Cost Estimation and Systems Acquisition. My contribution, which you can read here, addresses the challenges faced by estimators and the value of establishing a historical baseline to support smarter planning, counter unrealistic expectations, and maximize productivity. What is estimation accuracy, and how important is it really? What is the connection between the Financial Crisis of 2008 and software estimation? Why do small team projects outperform large team projects? 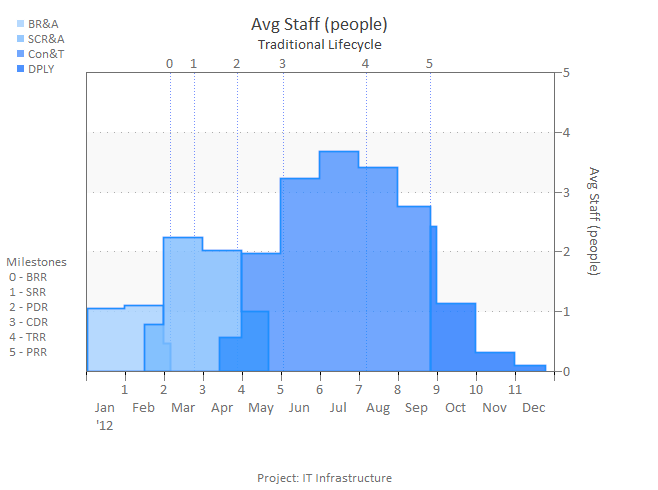 How can you find the optimal team size for your project? 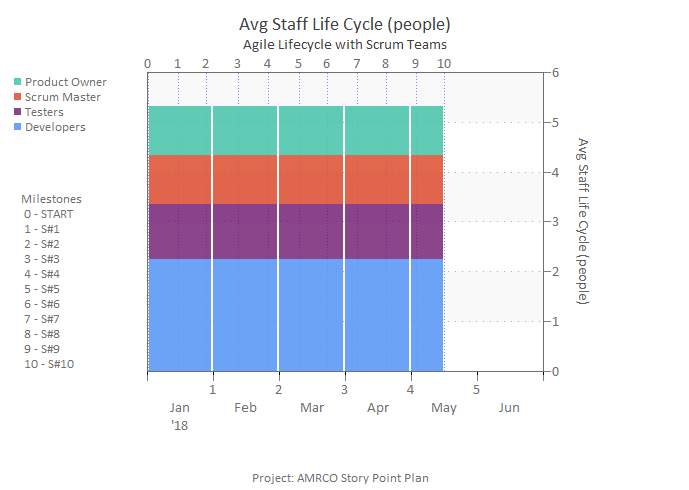 Larger teams create more defects, which in turn beget additional rework… These unplanned find/fix/retest cycles take additional time, drive up cost, and cancel out any schedule compression achieved by larger teams earlier in the lifecycle. 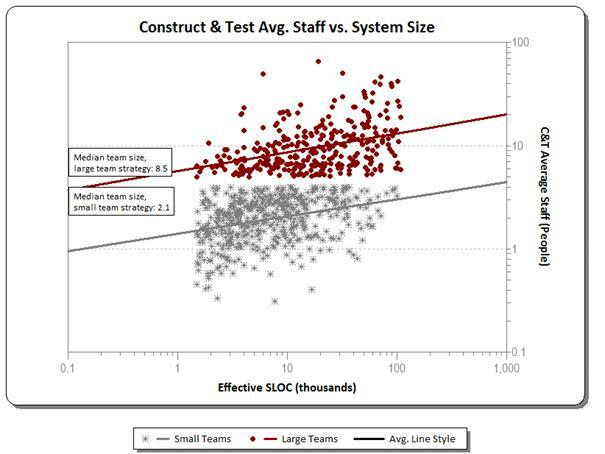 This is the second post in a three part investigation of how team size affects project performance, cost, quality, and productivity. Part one looked at cost and schedule performance for Best in Class and Worst in Class IT projects. For this study, Best in Class projects were those that delivered more than one standard deviation faster, but used more than one standard deviation less effort than the industry average for projects of the same size. A key characteristic of these top performing projects was the use of small teams: median team size for best in class projects was 4 FTEs (full time equivalent) people versus 17 FTEs for the worst performers. These size bins bracket the median team size of 4.6 for the overall sample, producing roughly equal groups of projects that cover the same size range. Our best/worst in class study found a 4 to 1 team size ratio between the best and worst performers. Have you ever found yourself wondering which SLIM tool to use for a task, or what interfacing features are available for various SLIM Suite applications? 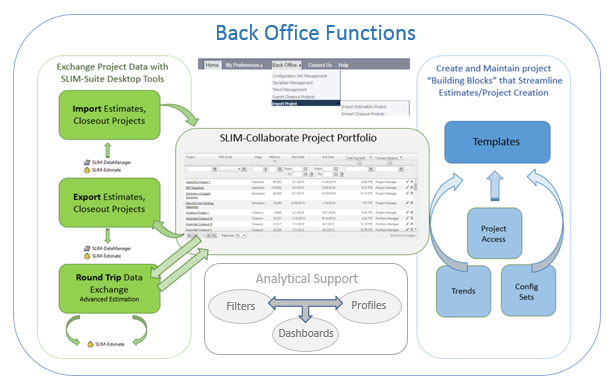 We've created a handy Quick Reference Guide that offers a concise, "at a glance" summary of the great features built into SLIM Suite! This one page table is chock full of useful information about import/export capabilities, major tool features, and interfaces to other SLIM tools or applications like Microsoft Project and IBM Rational Focal Point and Rational Team Concert. Whether you've licensed one or two applications or the entire tool suite, we hope our Quick Reference Guide will be a helpful resource. You can find more resources in the QSM Support section of our website.